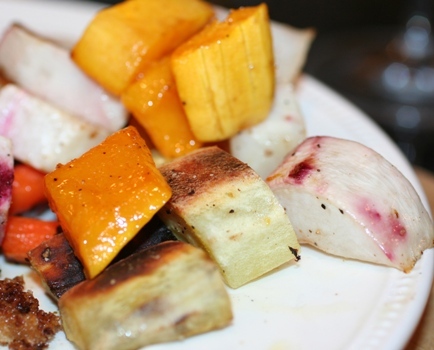 With our CSA winding down I only have a little of the vegetables left to cook with, but I had the perfect ones to make some wonderful Roasted Winter Vegetables. I just used the ones that I had on hand, but you can choose your favorite. I would have liked to use red onions over turnips; afterwards, I wished I had made a quick trip to the store 🙂 . I learned this week that turnips aren’t my favorite, so I will leave it up to you to add them or leave them out. The smell of roasted vegetables throughout the house was amazing. Oh, and then there was the eating. They are so sweet once they have been roasted. I love how the edges that are on the pan crisp up and the other side is soft. I kept it simple and just sprinkle them with salt and pepper, but these would have been wonderful with a little fresh rosemary too. 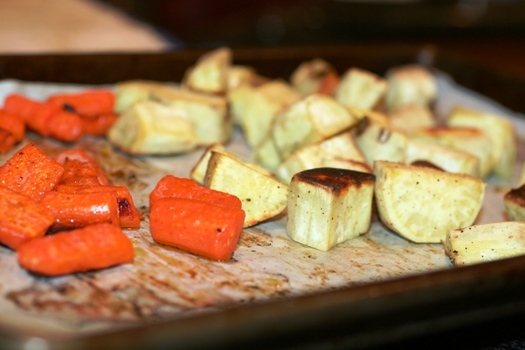 Take the vegetables and lay them out on 2 or 3 sheet pans. (I line mine with parchment paper to help with the mess.) Use whatever it takes so that your veggies are not on top of each other. 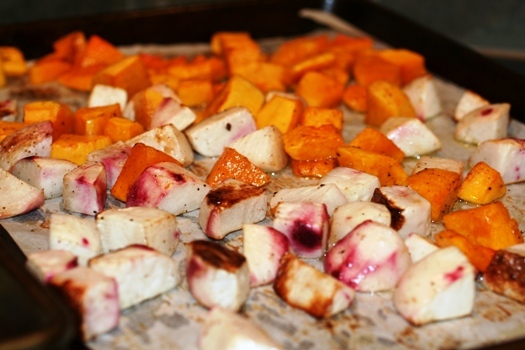 They roast better when they are not crammed together on the pan; that will steam them instead. You want the caramelization on the bottom that comes from roasting. Drizzle liberally with olive oil, then sprinkle with salt and pepper and toss gently. Put into the oven for 20-25 minutes or until tender and golden brown. 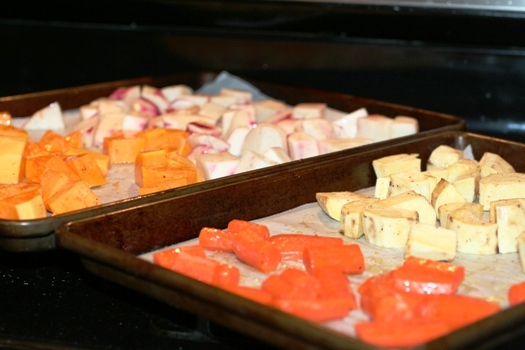 Arrange the vegetables in a single layer on 2-3 sheet pans. Bake for 20-25 minutes or until tender and golden brown. Sounds yummy! 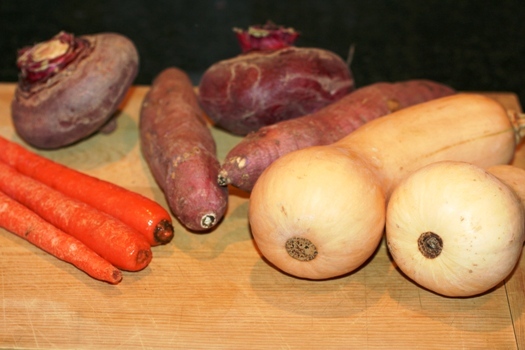 My version at home is usually carrots, parsnips, potatoes, onions, garlic and also a little fruit. I have been known to add grapes (any color but white ones do not hold up as well as red). Pears and apples are also delicious in this mix. I toss the whole mix in a bowl with olive oil and salt, pepper and a bit of rosemary and/or thyme. Turnips are good if you cut them like fries and drizzle them with a little olive oil and then mix seasalt and chilli powder and season them with that. The chilli powder helps with the bite that turnips have and gives them a tasty flavor. I want to encourage you to give that one a try.